I have a similar question. But apparently my last message might not be successfully registered. You can easily find the candidate's basic background including gender, education, age and tenure (experiences in public service). You also have the profile of supporters for each party and geographic areas. The former might not be easy to get, but the latter can be found in population data. 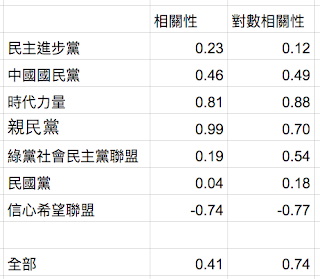 I think a multiple regression model of the candidate's own background should be the baseline. 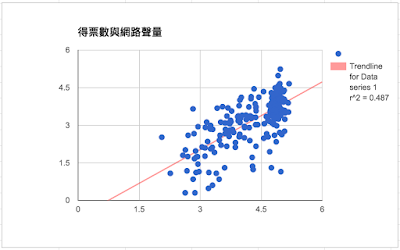 Then the socioeconomic characteristics can be the upper level. That is, I actually think this should be done as a multi-level model. As how many levels, it could be 2 or three, depending on how to you want to treat party and district. The party is an issue. 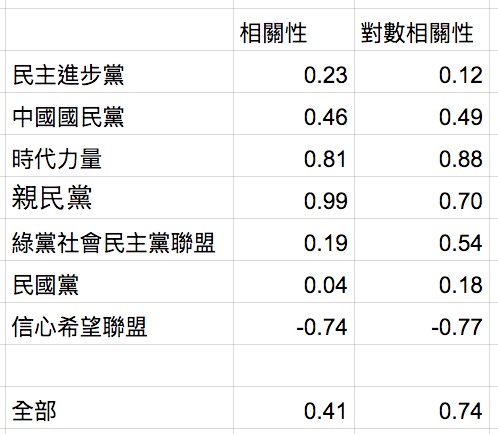 Of course, if you can find more than one measure of 網路聲量, you can also model your regressions in the format of structural equation model to control for measurement errors. In that part, it would be a useful methodological paper. Just some thoughts. Hopefully you will continue. The topic is on to something. just take one step at a time. 我也不否認我的推論是否正確, 只是我知道在這些數字的前提與偏見下 (Bias), 這個 0.74 這個數字 (投票數與討論數的相關系數) 是 Solid (堅實), 而能不能用就看大家..
但經過不是靈恩派的人建議, 我將之加上: "經人提醒, 應該改成當時信望盟的網路行為與主張反而把選票趕走, 應該要修改溝通策略或政見, 才能透過網路獲得更多選票..."
我還是蠻肯定的, 信望盟不知是甚麼原因, 造就了 "當網路的聲量越高, 得票數越低", 這或許是真的你們該去想的, 而不須要去否認這現像, 或否認網路.. 只是網路的確是不合適用神密經驗去體驗與感受的場所, 也不合這種佈道式來移殖, 網路也不合這種以恩典感知的方式來去獲得認同是有可能的... 不代表是有甚麼 "弱勢者以後不必在網路出聲, 請自己知道就好" 這種結論..., 因為因子沒那麼單純..
我剛看了文章又一遍, 我很確定的我沒寫出任何有關 "正面/負面" 聲量相關概念的事? 還是我有那些文字容易讓您誤解?